Management can mitigate financial risks by pursuing outgrower model. Converting complete 220,000 ha concession brings significant political, reputational, and financial risks. Outgrower model has short-term equity downside with long-term value proposition. Sime Darby (OTCPK:SMEBF) (SIME:MK), a Malaysian conglomerate, signed a 63-year concession agreement in 2009 for 220,000 ha of land to be developed into oil palm and rubber plantations in Liberia. An additional 44,000 ha are to be developed under an outgrower scheme. To date, Sime Darby has planted 10,411 ha palm oil and 107 ha rubber. Significant changes in Liberian context since 2009.Customary land rights are entrenched in Liberian legislation and efforts to halt deforestation have increased, heightening risks for Sime Darby’s original aggressive expansion plans. Sime Darby’s undeveloped land bank in Liberia contains high-density forest; thus 45% cannot be developedresponsibly. This figure is conservative as it is not adjusted for medium-density forest (an additional 34%) or biodiversity hotspots. Full concession development would require negotiations with an additional 55 communities.This could entail decades of negotiations with uncertain outcomes, and could result in significant delays to project development. Respecting a 2 km buffer zone around towns reduces the available area by 20%.Sime Darby’s share price could devaluate due to restrictions on the concession area. Mainstream investors continue to value Sime Darby’s Liberian project assuming full concession development. Sime Darby’s Liberian business model is at a crossroads. As shown in Figure 1 below, Sime Darby has three possible scenarios for future development. Sime Darby (SIME:MK) is a Malaysian-based corporation with operations in 26 countries and four territories. 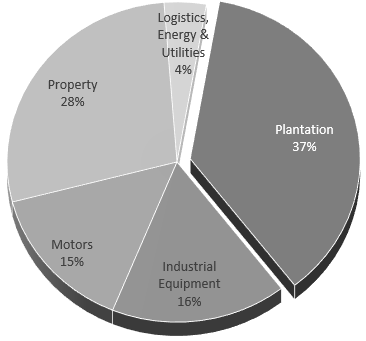 As shown in Figure 1 above, its core businesses include Industrial Equipment, Motors, Property, and Plantations. Sime Darby derived 37 percent of its FY 2015 operating profits from its Plantation division. Sime Darby Plantations have an annual output of 2.4 million metric tons representing 4 percent of the world’s annual crude palm oil (CPO) production. The Plantations Division is active in Peninsular Malaysia as well as in Indonesia, Papua New Guinea, Solomon Islands, and Liberia. Its total land bank encompasses 1 million ha, of which more than 600,000 ha are planted with oil palm. Sime Darby’s involvement in Liberia began when it merged with Kumpulan Guthrie and Golden Hope Plantations in 2007. Kumpulan Guthrie began investing in Liberia in 1981 after being assigned the BF Goodrich concession. During the Liberian civil war, the company was forced to abandon its operations due to security concerns and its rubber plantation was dormant. In 2008, the Government of Liberia opened talks to renew the terms and conditions of the old concession agreement with Sime Darby. A new company, Sime Darby Plantation (Liberia) Inc., was set up to manage the oil palm and rubber plantations. Sime Darby’s concession agreement allows for extension of the 63-year term if the parties agree prior to the expiration of the agreement. The concession is located west of Liberia’s capital Monrovia, in the counties of Gbarpolu, Bomi, Bong, and Grand Cape Mount. This concession corresponds to 22 percent of Sime Darby’s total global land bank. It was initially expected to involve capital expenditures of $3.1 billion over 15 years. In 2011, Sime Darby’s stated goal was to develop 120,000 ha by 2020. Its concession agreement foresees a ‘minimum development obligation’ of planting/replanting at least 75 percent or 165,000 ha of the concession area with oil palm or rubber trees by 2024, and 100 percent by 2029. In case of failure to develop, the undeveloped area shall be forfeited to the government. 1,567 ha of the planted oil palms have reached maturity and in 2016, this land yielded a total of 570 metric tons of CPO. Sime Darby is also financing and building a CPO mill at a cost of $18 million, expected to be operational in early 2017. It is estimated that a 20,000 ha oil palm land bank would be needed to meet mill capacity. Concession Agreement Ignored Land Rights: The Government of Liberia awarded the concession to Sime Darby as undeeded, thus failing to recognize the customary land rights of local communities. Additionally, the Liberia Extractive Industries Transparency Initiative (LEITI) post-award process auditconcluded that the contract was only partially compliant with national laws and procedures for awarding concessions. Cited breaches included a lack of a competitive bidding process and a concession term exceeding the legal 50-year maximum. While the concession was an amendment and restatement of the existing Guthrie concession, the LEITI argued that the expansion of the concession from 120,000 ha to 220,000 ha was material. No follow-up to these findings has taken place to date. The Land Rights Act would not directly impact the leasehold rights of concession holders, and the land will revert automatically to the community upon the expiration of the concession term. However, the solid anchoring of customary land rights in national policies, as well as communities’ increased awareness of their rights, put companies at additional risks when infringing them. Past Controversies: Shortly after commencing palm oil development in 2011, Sime Darby was subject to a Roundtable on Sustainable Palm Oil (RSPO) complaint by communities at the Matambo estate, for violations of customary land rights and failure to respect FPIC. Sime Darby received negative media and NGO attention stemming from alleged land right disputes, forced resettlement, outbreaks of violence, food insecurity resulting from land clearance, land compensation issues and insufficient wages for workers. While not all directly related to land conflicts or caused by Sime Darby, violent protests, arson attacks and conflicts have erupted several times in the developed areas of Sime Darby’s concession. Project Delays Halt Expansion: The project was interrupted by the 2014 Ebola epidemic and a subsequent self-imposed moratorium on new clearing. Sime Darby’s 2015 Annual Report announced an expansion of 6,000 ha of new palm oil and 4,000 ha of rubber plantations for 2016. However, no new clearings have taken place to date. Sime Darby has taken steps to improve its sustainability performance. It has committed itself to zero deforestation and an improved and thorough Free, Prior and Informed Consent process. The company stated publicly that it would not proceed with the development of areas where communities have not given their express approval. According to the company, community negotiations take on average two years. A multi-stakeholder program called the Sustainable Partnership Initiative (NASDAQ:SPI) has been implemented to foster company-community dialogue. High Carbon Stock (HCS) Forests: Sime Darby is currently evaluating the extent of High Carbon Stock forests on its Liberian concession and planned expansion areas, as part of a trial of the High Carbon Stock methodology. In 2014, the Sustainable Palm Oil Manifesto (SPOM) launched the High Carbon Stock Science Study after which Sime Darby announced a global moratorium on new plantings. The study resulted in the HCS+ methodology that aims to achieve zero net carbon emissions, and sets a maximum carbon threshold of 75 metric tons per ha for forest conversion, in addition to measures to protect biodiversity and human rights of communities. Environmental organizationscriticized HCS+ as less rigorous than the existing HCS approach. Sime Darby is piloting both the HCS approach and HCS+ methodologies in Liberia. Responsible Agriculture Charter: In 2016, Sime Darby launched its Responsible Agriculture Charter outlining the company’s approach to its global plantation activities. The charter makes various commitments to human rights, the environment, and corporate integrity. The commitments immediately apply to palm oil with a phased implementation for all other crops. Figure 3 below shows the land and forest cover of the undeveloped concession. This research has not uncovered past or current instances of large-scale deforestation. However, Sime Darby does have a high risk of deforestation for any future expansion. HCS Might Make 45 percent of the Concession Undevelopable: Any HCS areas identified in the pilot would be undevelopable by Sime Darby, given its SPOM commitments. 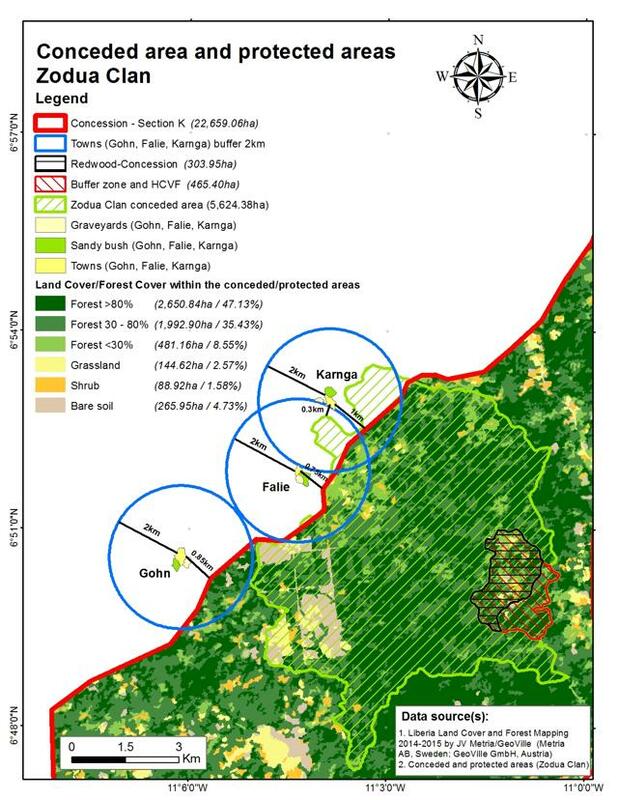 GIS analysis using the Forest Development Authority of Liberia’s data demonstrates that 45 percent of Sime Darby’s undeveloped concession is covered with high-density forests (area that is >80 percent forest) and an additional 34 percent is covered with medium density forests (area that is 30 percent to 80 percent forest). Sime Darby may not be able to develop these two forest areas types on its concession. Biodiversity and Endangered Species: Liberia is located in the Upper Guinean part of the Guinean Forest biodiversity hot spot, one of the most threatened and least-protected forest ecosystems in the world. These forests contain endangered species and exceptionally diverse flora and fauna. Some of Liberia’s 25 key biodiversity areas are located near Sime Darby’s concession. Birdlife International has included Liberia as an Endemic Bird Area (EBA), which means that it is home to globally endangered and vulnerable bird species, making it a global priority region for conservation. Nearby National Park Holds Unique Biodiversity: In September 2016, the Liberian Senate approved the act to form the Gola Forest National Park in the counties of Grand Cape Mount and Gbarpolu, on the border with Sierra Leone. This forest is one of the largest remaining intact areas of seasonal dense moist evergreen and semi-deciduous forests in West Africa. It is home to significant biodiversity, including several species new to science. While Sime Darby’s concession does not overlap with the Gola Forest National Park, its vicinity increases the likelihood of additional areas that need to be put aside for conservation. Current Community Negotiations Conducted Properly, But Outcomes Remain Uncertain: As shown in Figure 4 below, three communities of the Zodua Clan in the county of Grand Cape Mount have been in talks with Sime Darby for palm oil development on their land since 2010. A participatory rural appraisal (PRA) conducted by Aidenvironment in cooperation with Green Advocates in 2016 concluded that Sime Darby made a serious effort to conduct the land negotiation process in accordance with FPIC standards. While Sime Darby has signed Memorandums of Understanding with these communities as early as 2013, negotiations continue today, six-years after they commenced – and a number of issues remain unresolved. The community of Karnga initiated negotiations with the company expecting to receive compensation for crops within the buffer zone and/or outside of Sime Darby’s concession. As indicated during the PRA, a failure to resolve the compensation issue with Karnga could jeopardize the agreements made with the two other communities. The land under discussion maintains approximately 47 percent high-density forest that the company might not be able to develop if it stays in compliance with its HCS policies. Concession Development May Require an Additional 55 FPIC Negotiations: In addition to high forest cover, FPIC procedures pose a challenge to the full development of the concession area because of the multi-year negotiation process. GIS analysis identifies 491 villages and settlements currently located within the concession. Conservatively estimated, FPIC may be required for 55 communities within Sime Darby’s undeveloped concession. The company has indicated that a single process can take up to two years. The FPIC negotiations with the Zodua Clan took longer. Finally, some communities may not want to give up their land, or may negotiate on the exact amount of land for plantation development. 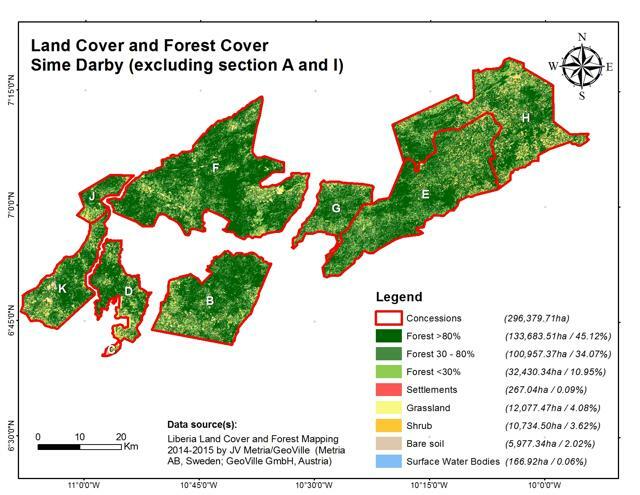 Buffer Zones May Reduce Concession Area by 20 Percent: As shown in Figure 5 above, even if Sime Darby receives FPIC from the local communities for development in this area, Sime Darby will not develop a 2 km buffer zone under its own FPIC procedures. A conservative estimate based on the size of the communities within the concession area reveals that the combined buffer zone area would reduce the full concession by 20 percent. For the remaining smaller settlements and homesteads outside these areas, Sime Darby policy does not require the creation of a buffer zone. Those villagers would have to be willing to relocate on a voluntary basis in order to allow development. Sime Darby Require An Additional 10,000 ha to Achieve Mill Profitability: Sime Darby has announced the construction of an $18 million palm oil mill in Liberia, expected to be operational in early 2017. The mill is designed to be able to process 30 to 60 tons of Fresh Fruit Brunches (FFB) per hour. Ultimately the project will require 20,000 ha to be viable and profitable. Operating Costs in Liberia Are Higher Than in Malaysia: The company has stated that it expects its Liberian operating costs to be 10 percent higher than its Malaysian costs. However, in light of its recent self-imposed moratorium, new FPIC and the HCS approaches, these projections may be conservative. Growing conditions are less favorable than in Southeast Asia and technology and workforce issues are additional factors that may reduce yield in Liberia. In addition, the company faces regulatory risks due to weak institutions and land rights conflicts. The current investment thesis assumes a full 220,000 ha development that would generate an extra $500 million in revenue. The $500 million extra sales would generate $60 million plus operating profit versus the FY16 operating profit of $274 million for the global plantations division. But given current structural changes to operating in Liberia, these figures, while maintained by analysts, may be out of date. Sime Darby Has a 17 percent Long-term Debt to Total Capital Ratio and a 3x Net Debt/EBITDA Multiple: The company had a consolidated Funds From Operation (FFO) adjusted net leverage of 1.7x in FY 2014. By December 2015, it had increased its leverage to 5.30x. FY 2015 debt increase was due to the debt-funded acquisition of New Britain Palm Oil Limited. During the FY 2016, the gross debt was reduced to RM15.8 billion, in line with the company’s measures to reduce debt. Therefore, it is necessary that the Liberian operations have positive margins. During Q1 2016, Sime Darby was downgraded by the three major rating agencies: Moody’s, Fitch, and Standard & Poor’s. In October 2016, Fitch upgraded Sime Darby’s debt from negative to neutral. The downgrades occurred due to delays in deleveraging, the global economic outlook, and commodity prices. In 2016, Sime Darby raised $78 million from selling part of its stake in Eastern & Oriental and raised $131 million from selling land in Malaysia and Singapore. It also disposed of other real property assets in Singapore and Australia. In October 2016, Sime Darby raised $571 million in a private placement of 316.35 million shares that was 2.5x oversold and was the 3rd largest capital markets deal in SE Asia in 2016. Sime Darby may be able to continue to deleverage until 2018, targeting a cost of debt and equity ratio similar to FY 2014. However, the plans to reduce both its debt and the cost of debt can be undermined if Sime Darby does not respect the FPIC and the HCV policies while developing plantations in Liberia. As shown in Figure 6 below, Sime Darby’s banks include HSBC (NYSE:HSBC), Standard Chartered (OTCPK:SCBFF) and Citigroup (NYSE:C) that have sustainability policies that might prevent additional lending in the case actions violate lending criteria regarding FPIC and deforestation. As shown below in Figure 7, consensus analyst forecasts assume the Liberian expansion will include a full build-out of the 220,000 ha. Analysis calculates Sime Darby’s present value close to $1.1 billion. Analysts currently assume a complete development of the 220,000 ha Liberian concession. Sime Darby expects to plant 6,000 ha of palm oil and 4,000 ha of rubber during 2016-17. Compared to its peer group, shown above in Figure 8, Sime Darby has a Net Debt/EBITDA similar to the peer mean, despite the fact that the company is working to reduce the leverage. Compared to its peers, Sime Darby has higher P/E and EV/EBITDA. Sime Darby’s Liberian Operations Are At A Crossroads: The company needs to develop a new strategy for the coming years, reflecting both market and environmental and social risk trends. In light of these trends, three expansion scenarios exist. Analysis suggests that Sime Darby would benefit from pursuing a Scenario C – shift to a 100 percent outgrower model – while maintaining its 20,000 ha plantation to supply its CPO mill. Forceful removal of a large number of communities, the deforestation of large tracks of land, and no respect for buffer zones. As customary land rights are today entrenched in Liberian legislation, such violations could lead to fines, sanctions and/or legal costs. Communities might challenge violations of their rights leading to stop-work orders, administrative fees, or criminal punishment and other sanctions. Court proceedings and compensation costs could increase Sime Darby’s expenses. Conflicts with communities could also turn violent. In April 2016, road blockades, arson attacks, and destruction of property occurred. Suspension of activities, replacements of damaged equipment or assets, as well as remediation and compensation processes could also increase the operating costs. Developing HCS forests or HCV land would increase reputational risks. Public access to satellite footage make it now near impossible to clear forested areas unnoticed. The reputational risks associated with developing HCS forests or HCV areas are significant, especially as Sime Darby has publicly positioned itself as a leader in implementing zero deforestation policies. Scenario A might require Sime Darby to unwind part of its concession. The requirement of higher compensation and the challenges to refinance loans attached to the Liberian concession expansion increases long-term WACC by approximately 10 percent from the current company long-term WACC of 7 percent to 7.6 percent. Reduction in revenue given potential operational risks might occur and could result in reduction in revenue of 10 percent. The unsustainable practices could also add a 10% additional risk of the concession being revoked. As this scenario would have both negative financial and reputational implications, the likelihood of this scenario materializing is low. Finally, the risks and costs mentioned above could reduce the net present value (NPV) of the project to $90 million, from the previous $1.1 billion. This might result in a potential equity price decrease of 8 percent by FY 2017. Scenario B assumes Sime Darby respects the 2 km buffer zones, obtains FPIC from the required 55 communities, and preserves HCS forests. This may lead to a three-year project delay beyond the baseline scenario. This scenario will require direct negotiations, financial compensation, and reparations to local communities, increasing the project cost. As a result, production costs might rise from the current 83 percent of revenue to 87 percent of revenue. In this scenario, maximum developable land bank is 121,000 ha. This sums the 20% that has to be respected as buffer zones and 45% of the remaining concession that is densely forested. It does not include the impacts of the biodiversity concerns. FPIC negotiation estimates are for two years while current negotiations with the Zodua Clan have taken six years. They are still ongoing. Full development of its concession area requires Sime Darby to conclude FPIC negotiations with an estimated 55 communities. Zodua Clan experience demonstrates ‘moving targets’ risks. As talks with communities drag on over time, contexts may change making intermediate agreements obsolete. The estimated value of the investment under the second scenario is $0.43 billion, reducing the project value by $0.67 billion, in comparison to analysts’ assumptions. This would represent a devaluation of 5 percent in the stock price by FY 2017. Scenario B advantages include Sime Darby keeping the project without adding reputational risks and maintaining its investors and costumers as well as sustainability certifications. But Scenario B includes significant possible delays and risks related to community conflict remain present. In Scenario C, Sime Darby abandons the idea of expansion of its own plantations, and relies on an outgrower model for development of its concession. This requires a paradigm shift away from its initial business model to a participatory approach that balances all interests. It would be the scenario with the lowest chance for local conflicts to develop, less strenuous and time-consuming FPIC processes, and is most in line with the emerging agendas for economic development and environmental conservation. The company is already taking a role in furthering the thinking on effective smallholder models through the SHARP Platform and the partnership with the sustainable trade initiative IDH. The production-protection agreements that are part of the IDH partnership are intended to converge local economic development with a reduction of community-spurred deforestation. This partnership is an example of how Sime Darby is exploring alternative models for its outgrower scheme as stipulated in the original concession agreement, while stopping short of making it the core of the company’s business model in Liberia. As outgrower models avoid contentious land ownership disputes, this could also be a potential contribution to further stability in Liberia as a whole. Ensure communities’ land rights in order to incentivize productivity. Sime Darby could publicly speak out in support of the Land Rights Act currently before legislature. Renegotiate its concession agreement with the Government of Liberia. The current concession agreement is recognized as one of the root causes for the occurrence of violent protests. Ensure technical and financial support to outgrowers to mitigate risks. Examplesin Liberia’s rubber sector illustrate the detrimental effects for smallholders when companies abandon support projects before trees reach maturity. In addition, such an approach may also be in the interest of the Government of Liberia, as it has a positive impact on local economic development and stability. Furthermore, the UNFCCC 2015 Paris Agreement refers to REDD+ because this approach creates a financial value for carbon stored in forests and offers incentives to developing countries to reduce emissions from forested lands. Liberia has been supported in its activities towards REDD+ readiness since 2012, when it received a $3.6 million grant from the World Bank’s Forest Carbon Partnership Facility (FCPF) to develop Liberia’s national REDD+ strategy. Since 2014, the Governments of Liberia and Norway are cooperating in a REDD+ program aiming to protect Liberia’s natural forests, restoring degraded lands, and developing Liberia’s agricultural sector through enhancing sustainable agricultural management, and greening supply chains.